Even horticulturally acceptable types of soil can help or hinder the trellis builder, and familiarity with the type of soil where your trellises are to be built can greatly influence your selection of materials and construction methods. Generally, regardless whether your soil is soft, medium or hard clay, or sandy, the best method of setting the posts for high-tensile wire trellises is by driving. Driven wood posts have greater resistance to pullout, pushdown and overturning than wood posts of the same length and diameter that are set by digging and hand tamping. While setting posts in hard soils may necessitate buying or renting a powered post hole auger and/or a hydraulic post driver, such equipment may prove well worth the investment. Orchards and vineyards are usually planted on flat or gently sloping land, but you should be aware of any natural or man-made hazards. Even in rural areas, you are required by law to check with local electric utility and telephone companies regarding possible buried cables, and with water, gas and sewer authorities regarding buried pipelines. Trees and vines are usually planted in straight rows on ground that ranges from relatively flat to rolling or hilly. Building trellises around curves and on hilly areas presents special problems, most of which can be solved with special construction techniques and materials. Remember, in building any trellis, it is important to keep all wires parallel and the same heights off the ground, so if there are severe changes in topography, it may be necessary to install longer line posts with closer spacing between them. Many factors influence the design of high-tensile wire trellises. For example, although the designs may appear to be similar, a trellis that is designed to support dwarf apple trees can be ineffective for supporting peach trees. Consider your horticultural requirements- the types and varieties of trees or vines you will be planting, recommended distances between plantings, anticipated growth rates, growth heights from planting to maturity, desired training patterns, pruning objectives and techniques, expected yield (bushels and weight per planting) and harvesting techniques. If you believe you may be expanding your orchard or vineyard in the future, take that into account when you plan your initial installation. It may be possible to simply extend trellis rows in the future. Orientation is important; so if sunlight, drainage and other horticultural factors permit it, consider orienting the initial planting rows in a direction that will allow extension later. Because of the greater strength of high-tensile wire, longer trellis rows are possible. If longer rows are desired-depending on length - build sections of trellis that are separated by independent end brace assemblies. Space should be provided between independent brace assemblies to permit convenient access for workers and vehicles. Your future plans - as well as your knowledge of the characteristics of your planting stock - will be helpful in selecting the most practical designs of high-tensile wire trellises for your needs. Locating trellises properly is almost an art. This is particularly true of high-yield concentrated plantings and pick-it-yourself operations. Considering individual horticultural requirements, trellises should be located for maximum production per acre. Location should also allow for efficient movement of workers and mechanized equipment. 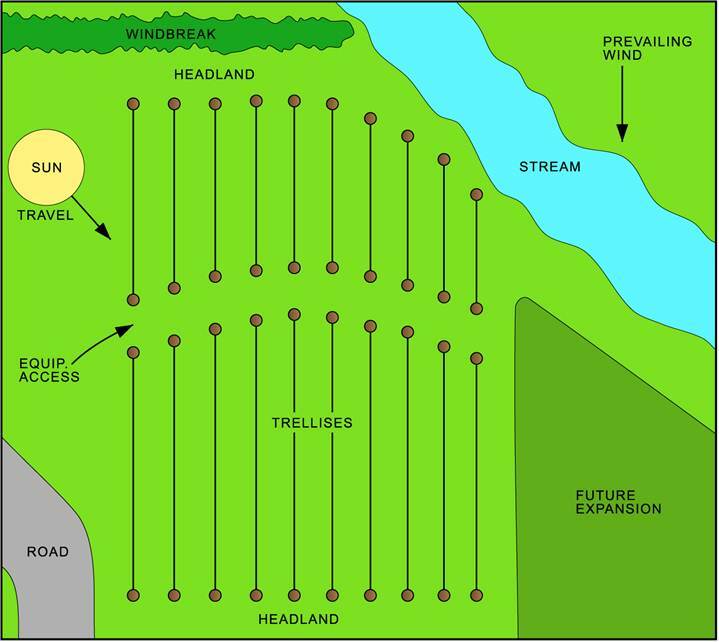 Headland space - the distance between the ends of the trellis rows and the orchard or vineyard boundary - should be sufficient to permit easy turning of equipment. Consider the size and shape of mature trees and allow enough space for pruning and harvesting. Consider re-orienting the rows if sunlight or wind direction is a factor. Generally, it is easier to plant trees or vines before the trellis is built - especially if a mechanical planter is used - so plan accordingly. Having determined the type of high-tensile wire trellis you wish to build, it is essential to prepare a sketch of the entire orchard or vineyard marking the length of each row, and any special characteristics which can influence the selection of materials or construction techniques. Such a sketch and a corresponding list of materials enables you or your contractor to determine the number of posts, feet of wire, the hardware and accessories, the time - and especially the cost - of the job. See Figure 2 for a sketch of typical factors that can be considered. This manual should answer most questions about planning and building high-tensile wire trellises. However, the trellis examples shown herein are for illustration purposes only. Each trellis is different and should be considered as an individual design and construction project. Your contractor or dealer may be able to provide additional information on high-tensile wire trellis material requirements and construction techniques. Before planting, contact your county agent or your state agricultural extension service for horticultural information, particularly the relationship between plants and trellises.